Bossltg 50 FOOT 25KVA PORTABLE UTILITY GEN-SET WATER FUEL LIGHT TOWER: MQ POWER 25kva Diesel Engine Driven Gen-set to power on-site Guard Shack Office Trailers, heaters for porta cans, and supply 25 acres of area illumination. Package wired with RV type Trailer Receptacles, 1 x 100a, 125/250v Rv plug in. 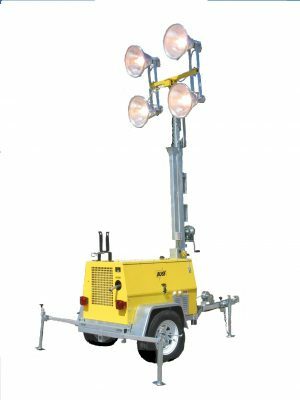 8 – 1500W Metal Halide Floodlights for Security and Production lighting mounted on a 50ft electric Telescoping Tower, trailer includes a 300g Fresh Water Tank with electric pump, and, a 175 Gallon Storage Diesel Tank. Total package assembled on Dual axle trailer mounted with towing package. Operates for 24hrs on 41 gallons gen-set fuel tank. 50 FOOT 25KVA PORTABLE UTILITY GEN-SET WATER FUEL LIGHT TOWER. This Bossltg Utility Service Trailer was designed to make available Gen-set power for on-site Guard Shack Office Trailers and to supply axillary power, fresh water and diesel fuel storage. Security Floodlighting telescoping 50′ above grade for guards and site managers to be able to monitor production and security over a larger area of project sites. Plus have available on-site at all time a Fresh Supply of Water and Axillary fuel. 8 x 1500w Metal Halide floodlights at 50′ will illuminate 25 acres and project light 800 feet. 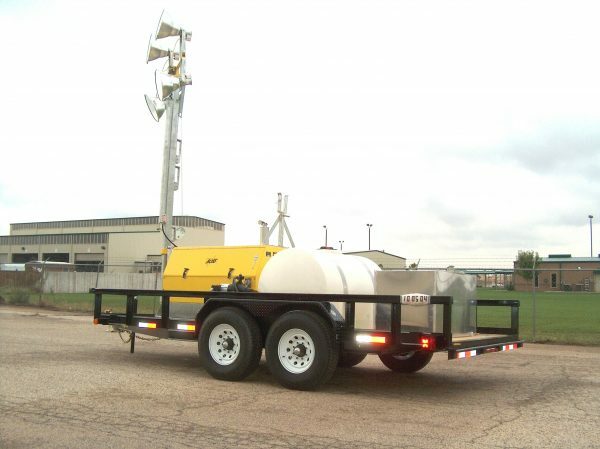 The 50 FOOT 25KVA PORTABLE UTILITY GEN-SET WATER FUEL LIGHT TOWER includes a MQ POWER water-Cooled Diesel gen-set. 25kva , 480v-3ph & 120v/240v,1ph, generator, 41 gallon fuel tank,(24hrs) running time. Gen-set will have a single 100amp, 125/250v, RV outlet, capable of powering a guard shack 120v Air/Heater System, refrigerator, lights and computer terminals. Approx 5000w axillary standby power. A 300 gallon fresh water holding tank with electric transfer pump and a 175 gallon axillary fuel storage tank with fuel hose dispensary. 8 x 1500w metal halide floodlight mounted on a 50′ electric winch operated tower. This lighting package will illuminate 25+ acres and project light over 800′ at an 180* beam pattern. Total package system mounted on a towable trailer. DOT lighting towing package with electric brakes. Bossltg was the first light tower producer to offer this style of Utility Service package dating back to 2004. West Texas Oil servicing contractor were responsible for this products design and engineering features. The Bossltg Utility Service Trailer will need 90 day advance notice to produce for shipments.